Congress to Remove Safety from Transportation: ACT NOW! Last year, pedestrian fatalities rose while vehicle fatalities dropped. So why does the House want to cut the tiny slice of funding that helps improve safety for people on foot or on bike? And with 69,000 structurally deficient bridges, why aren’t they requiring states to fix their bridges before building new highways? Take just a minute and join me in telling your Representatives to support two key amendments in Thursday’s markup of the House transportation bill. We have just a few hours left to weigh in before they vote Thursday morning. "The project will help the community and help move us toward a more walkable and safe township. 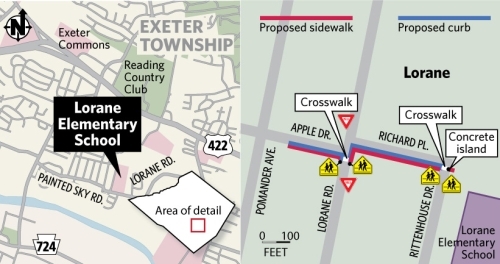 This is a big win for Exeter Township!" "More than just walking to school, there will also be a walking tour of historical sites in the area of, including the Exeter Station." To read the full Reading Eagle Article, click here. ACT NOW: Save Biking / Walking Funding! (CHAPEL HILL, N.C.) January 19, 2012 – Prepare to switch gears this spring. The National Center for Safe Routes to School announced today that it will be coordinating the first-ever National Bike to School Day on Wednesday, May 9, 2012. Bike to School Day builds on the popularity and success of International Walk to School Day, which is celebrated across the country – and the world – each October, and encourages a bike-focused celebration in the month of May. The National Center, which serves as the information clearinghouse for the federal Safe Routes to School program, is planning the inaugural event in partnership with the League of American Bicyclists, the organization that leads the celebration of National Bike Month. Save the date and stay tuned! A newly redesigned version of www.walktoschool.org will be unveiled in early April with more information about Bike to School Day and new event planning resources and tools, including a new GIS-powered walking and bicycling route mapping tool. A “Win a Bike Rack” contest is also being planned to help build excitement and encourage registration of both events and resources for this inaugural event. Bookmark www.walktoschool.org and check back often to learn more. National Bike to School Day is based on the Walk to School Day model. Walk to School Day was founded in 1997 as a way to bring community leaders and children together to build awareness for communities to be more walkable. The one-day event has now grown to a month-long celebration. In 2011, students and parents from more than 4,000 U.S. schools joined millions of Walk to School Day and Month participants worldwide. The reasons for walking have grown just as quickly as the event itself. For more information, visit www.walktoschool.org. Bike to School Day, a part of the National Bike Month, will be held on Wednesday, May 9, the week before Bike to Work Week and Bike to Work Day. About the League of American BicyclistsThe League of American Bicyclists promotes bicycling for fun, fitness and transportation, and works through advocacy and education for a bicycle‐friendly America. The League represents the interests of America's 57 million bicyclists, including its 300,000 members and affiliates. For more information or to support the League, visit www.bikeleague.org. A new project is being offered through a partnership of Berks County Intermediate Unit with Walk Bike Berks called “Safe Routes Berks.” The purpose of Safe Routes Berks is to encourage pedestrian and bicycle safety for Berks County K-8 students as they walk/bike to school or the bus stop. Safe Routes Berks instructors will provide curriculum, training, support, and resources for K-8 health and physical education teachers. The initiative, which is funded by a number of sources including US Department of Transportation, will cover all costs related to professional development ( including substitute fees for teachers, curriculum and other resources/materials). Committee members will be required to attend 3 evaluation sessions throughout 2012 and 2013, beginning February 14 and 15. Substitute fees will be reimbursed. 3. Scroll down to Step One and click on the link "click here to view course catalog"
I’m a registered user – select this option if you have already created a personal account in My Learning Plan (MLP). I’m a new user – select this option if you do not have an account. By completing this you are establishing an account with a username and password in a secure location for future reference. You can update or change any of this information as needed. For more information about the course, please contact Michele Barrett at info@walkbikeberks.org.